The moment in particular is a slight change to one of the episode’s most tense moments. If you’ve gone down the path that involves killing Stefan’s dad (and potentially chopping up his body), an ominous knock at the door follows. It’s Colin. In the actual episode, you can either bump him off or have Colin enter Stefan’s room to take a look at Bandersnatch. That’s not how it could have turned out, and not how Whitehead wanted it to play out. D'aww. 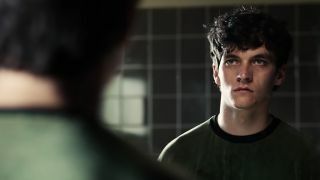 That would’ve really separated the nice from the nasty, too, and would have potentially been one of the softer Black Mirror: Bandersnatch endings (if you can call a mental breakdown after killing your dad ‘soft’ anyway). Either way, the hugging it out ending didn’t make it in, for better or worse. It still would’ve been an easier choice than picking between Frosties or Sugar Puffs. Still feeling a little indecisive after Bandersnatch? Not to worry, we've put together the best movies on Netflix and best shows on Netflix just for you.